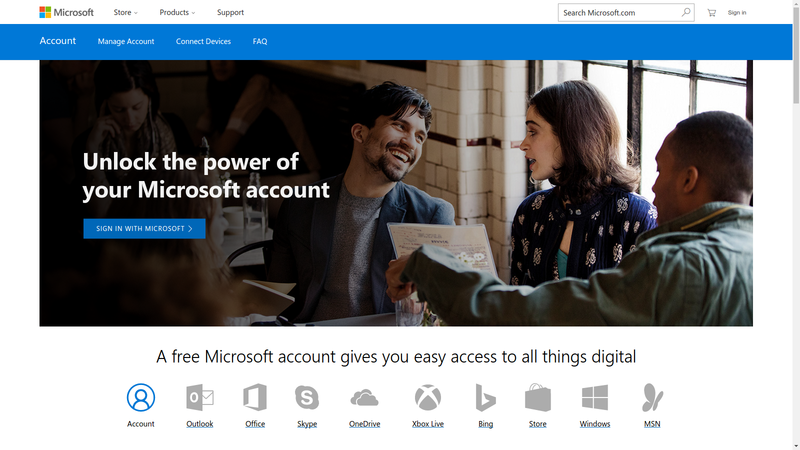 Create a Microsoft account if you don’t already have one. Go to the Microsoft Azure Notebooks web site and sign in. Select “Libraries” in the navigation bar (libraries are groups of related notebooks) and create a new library named “Sandbox”. 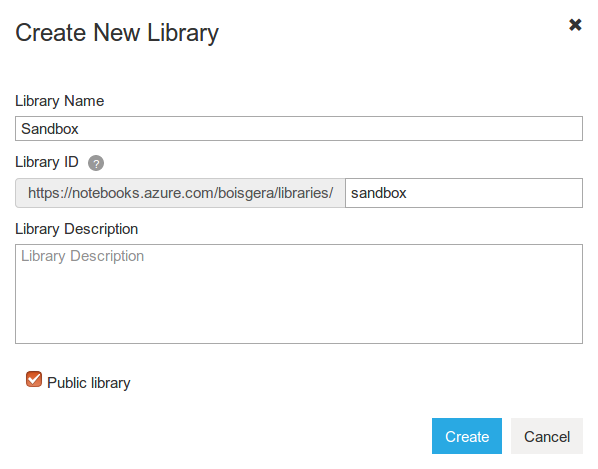 Create a new notebook named “My First Notebook.ipynb” in the Sandbox library, or upload an existing one. 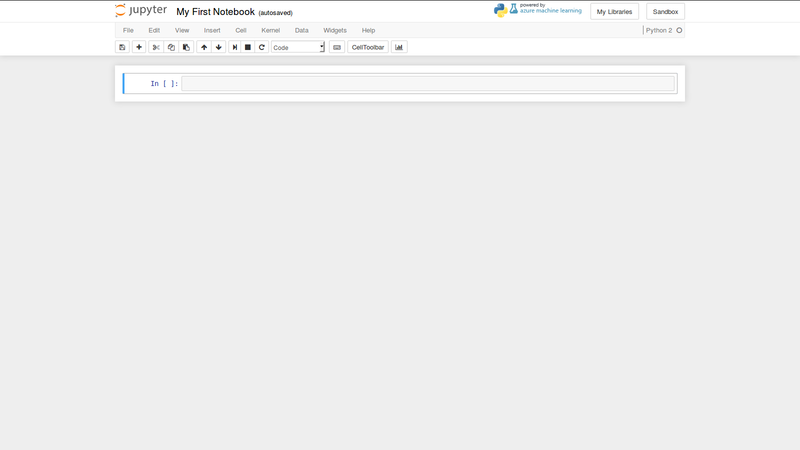 For this article, I will use a new Python 2.7 notebook. To explore the Azure plaform hosting the Jupyter notebook, we will issue some shell commands; the simplest way to do that if from within a Python notebook is to type the command in a cell, prefixed with an exclamation point1. The distribution used is the latest LTS version of Ubuntu: Xenial Xerus. What it means concretely is that when you start – or restart – a notebook, you are likely to wait for a couple of seconds while Azure is provisioning a new container. As far as I can tell, container instances are shared between notebooks in the same library, but not across libraries. >> !lscpu | grep "Model name"
PassMark gives this CPU a mark of 16.904; this is far better than the laptop I am working on, so I guess that performance is uniquely to be an issue. 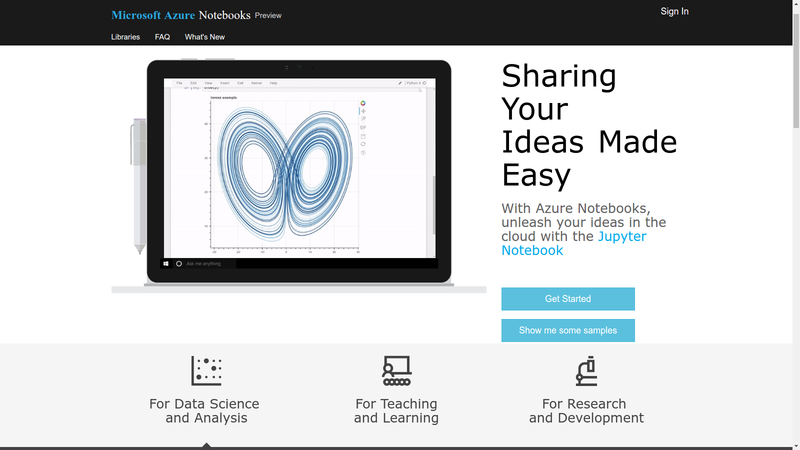 If you use the Jupyter Notebook App, which executes the notebooks on your computer, or if you have deployed a JupyterHub server, the input data that you use for your notebooks, the ouput data that they may produce and the notebooks themselves are in the same filesystem, probably organized into directories, one for each projects. Things are different for Azure notebooks, where notebooks and data are handled separately. Notebook files (with the .ipynb extension) are stored permanently and associated to your Microsoft account; they can be managed from the Libraries view and/or from the dashboard. You can also download/upload them if you loke but this is not mandatory. However, you will not find them in the filesystem accessible in the notebook 2. If your notebook requires some input data, you need to check that it’s available before you execute the notebook, or “rehydrate” your filesystem, upload this data again. If your notebook produces some output data that you want to keep, you need to download it. For both steps there are several options available. You may upload/download your data manually from/to your computer: use the “Data” menu in the notebook navigation panel. Data may also be uploaded from a Dropbox account. >>> !zip -q -r data.zip . -x "anaconda*" ". *"
Note that these commands work in Azure notebooks because https://transfer.sh is explicitly whitelisted (see Networking), so use specifically this service; other file sharing sites probably won’t work. Each distribution supports a different version of Python (at the time of writing: Python 2.7.11, 3.5.1 and 3.6.0). Note that these installations are performed as a user, not at the system level: you are merely nbuser and you don’t have administrator rights in the Azure container. In particular, you won’t be able to apt-get install your way out of missing software.